Getting a royal flush in poker is like finding a needle in a haystack: It’s doable, but it’s not easy. We at 12BET are aware of this, and so we’ve introduced the game “2 Ways Royal”. As the name implies, there are two winning hands you can have in this game. You can either get 2, 3, 4, 5, 6 of the same suit (Lo Royal Flush) or 10, J, Q, K, A of the same suit also (Hi Royal Flush). Don’t be fooled by the words “Hi” and “Lo”; as you can see in the pay table (pictured), you’ll get the same amount of winnings from both. Once you get a winning combination, you have the option to Collect or Double your winnings. If you click ‘Double’, the dealer will give you one face-up card, and four face-down cards to choose from. Should your chosen card be higher than the dealer’s, that’s the time you can collect double. In the event your card equals the dealer’s in rank, you can ‘Collect’ or ‘Double’ again. You can also click Double Half, and have a chance to double just half of your winnings. Though you’ll get less money under this setup, you’ll also take on less risk, since you can still keep half your winnings no matter what happens. Online poker games can’t get any more exciting than this. 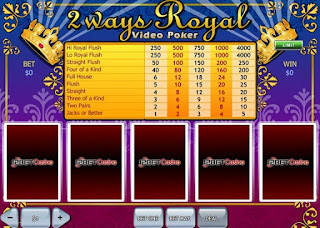 Play ‘2 Ways Royal’ now, and exercise your poker playing, decision making, and money making skills all at once!